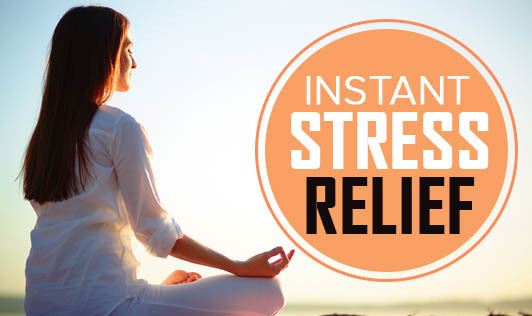 We've all been in situations where we needed on-the-spot stress relief. Stress is unavoidable in everyday life but you can reduce stress as soon as it strikes. We all don't have time for pedicures, massages, therapy sessions and long soaks in the bath. • Grin and hold it: Smiling, even when you don't feel happy, can instantly lift your mood. Instead of frowning or tensing up your forehead in reaction to a stressor, grin and feel it! Try it now! • Call a friend: Sometimes, you just need to call a friend and vent. Just getting off whatever is troubling you will help you calm down and keep things in perspective. • Aromatherapy: Certain scents can help you calm down, rejuvenate and revitalise. Keep your favourite scented products around and take a few whiffs when you're stressed out and notice the instant calm you feel. • Visualize: Close your eyes and imagine the world's most perfect, serene place. It can be rolling hills or even a familiar childhood place. You'll notice how safe and relaxed you feel by picturing this place. Whenever you need a short escape, remember you can always return there in your mind. • Music: Listen to your favourite music, the one that you find most relaxing. Tune into soothing music and tune out the world around you. • Close your eyes: The simple act of closing your eyes and breathing deeply can do wonders during a stressful day. You can do this a number of times throughout the day to help your body and mind relax. • Take a walk: Exercise, even when done leisurely, is a wonderful way to alleviate stress and boost endorphins, the feel good chemical in the brain. Go outside and walk for a few minutes, you'll be astonished at how much better you'll feel. So, the next time you feel like you need an instant stress buster - try the above!